Electric utilities are moving rapidly toward clean energy. Now it’s time to focus on transportation. Editor’s Note: This is the last of a three-part series by Blue Planet Foundation on Hawaii’s clean energy progress. In the final segment of the series introducing Blue Planet Foundation’s 2016 Energy Report Card, which launches today, we take a look at the big picture. Where are we on the road to 100 percent clean energy? Annual fossil fuel consumption in Hawaii is dropping. 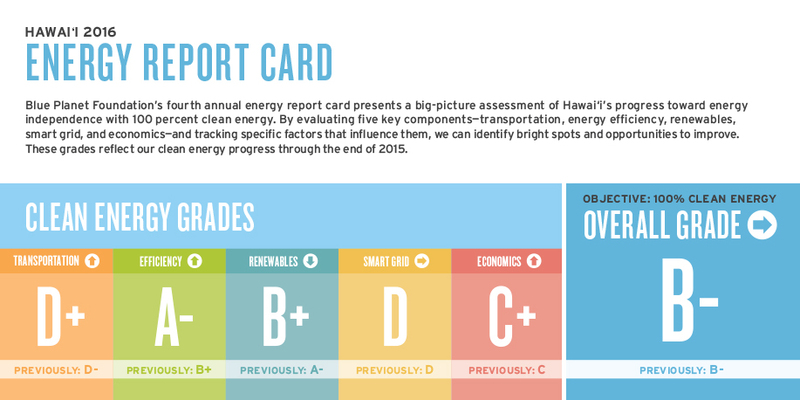 Blue Planet Foundation’s Energy Report Card is a snapshot showing Hawaii’s progress at a particular point in time. For 2016, that snapshot shows that the renewable energy groundwork laid in prior years is paying off. With around 23 percent of sales coming from renewable resources, electric utilities are ahead of the 15 percent target set by law. Solar power is leading this charge, having recently overtaken wind power as the state’s top renewable resource. And rooftops are proving to be a particularly valuable resource, currently providing about seven times more power than solar farms. This rooftop revolution has built a local industry, generating jobs and tax revenues along with clean power. 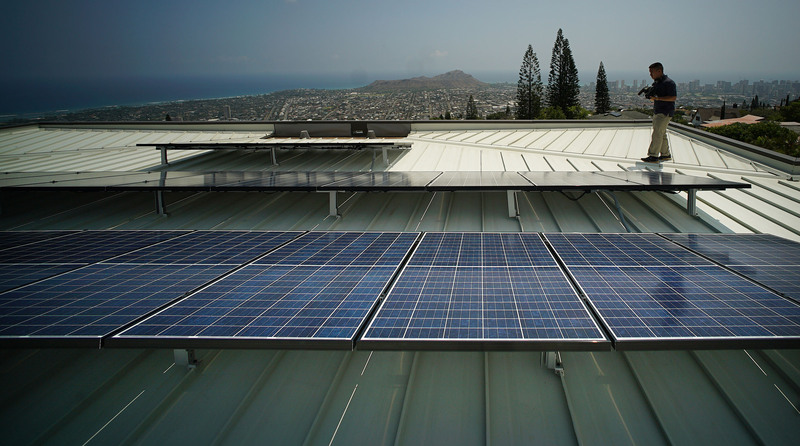 This rooftop photovoltaic system powers a Tesla battery system at a Honolulu residence. We’re ahead of the game financially, too. In the early 1980s, Hawaii spent 14 percent of its disposable income on fossil fuels when the cost of oil spiked. We saw another spike before 2010. Thankfully, we are back on a downward trend, at around 8 percent in 2015. Electricity rates are at their lowest in years. Some of this good news is a product of near record-low oil prices. But renewable energy is helping, particularly since it tends to have a fixed price and won’t get more expensive over time. In fact, the price of solar and wind has been steadily dropping. Today is the perfect time to double down on that trend, before the state gets slammed with another oil spike. Proposed utility plans for getting to 100 percent renewable electricity are slowly coming around. The latest versions forecast that Molokai and Lanai will reach 100 percent by 2030, with Maui and the Big Island getting there by 2040. 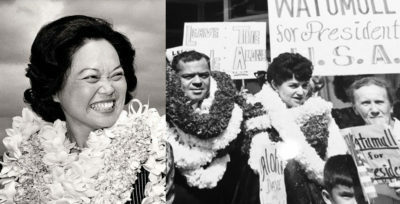 They will join islands like Iceland, Kodiak, and Tokelau, who have already reached 100 percent. The local solar industry is being strangled, beset by layoffs and reduced work schedules. Last year, Hawaii became the first state in the country to end the phenomenally popular “net energy metering” program. 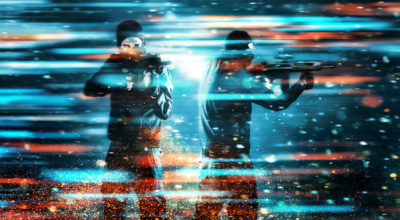 The replacement program, “customer grid supply,” is already full. For now, if somebody wants solar panels on their roof, it must be a “self supply” system that doesn’t share any of that clean energy with the grid. Electricity customers need more options, and small solar businesses across the state need and deserve steadier solar policies to maintain the momentum they’ve successfully created. Good paying local jobs are at stake. Even with steady rooftop solar policies, roughly half of us — renters, condo owners, and others — can’t put solar panels on our roofs. After years of advocacy by Blue Planet Foundation and others, the Legislature aimed to solve that problem in 2015. “Community solar” can enable anyone to benefit from solar power. Panels could be installed at your neighbor’s house, or your church. They could be on an empty warehouse roof, or set in a small solar garden in your community. This concept is sweeping across the nation, but yet another year has passed and Hawaii still doesn’t have a community solar option. Large-scale solar farms have not fared much better. Although some are in the works, several others were cancelled this year. That was particularly disappointing coming alongside a proposal to expand coal power on Oahu through 2022. These setbacks aren’t reflected in the data for the 2016 Report Card. But without laying the groundwork today, we can’t expect to maintain progress tomorrow. 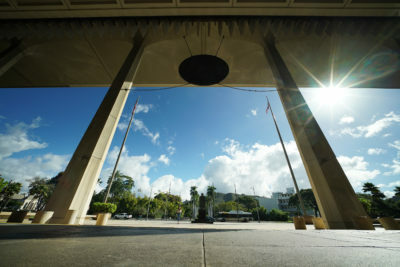 Hawaii has a strong history of energy innovation, like Iolani Palace becoming the world’s first royal residence to be lit by electricity, in 1886. That history can carry us forward. Working with electric utilities, car dealers, bus systems, and others, we can rapidly electrify our transportation fleet. Electric vehicles can give us cleaner, cheaper, and quieter transportation. Even better, as the grid becomes greener over time, so too will electric vehicles, as they help to enable more renewable electricity and lower electricity costs. 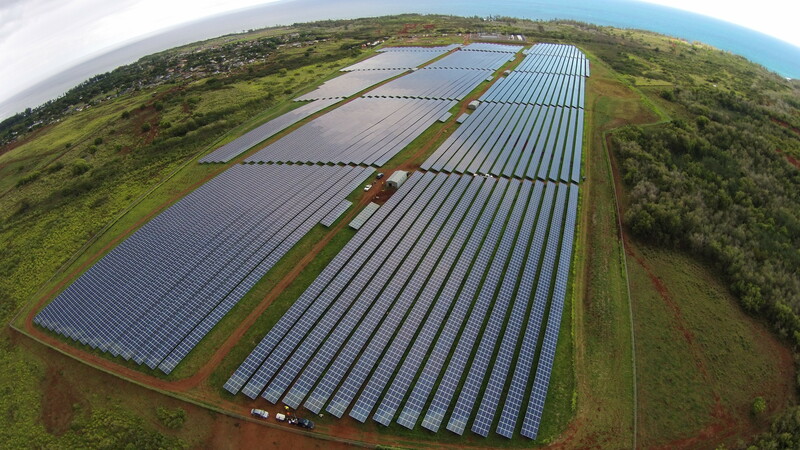 The energy cooperative on Kauai oversaw the massive Anahola solar project. This kind of positive feedback and innovation loop will revolutionize our energy system faster than we can imagine. To spark this change, it’s time for the state to adopt a 100 percent renewable transportation target to match our renewable electricity law. While we’re at it, we need to clean up loopholes in the renewables law, so that 100 percent means 100 percent. What else? 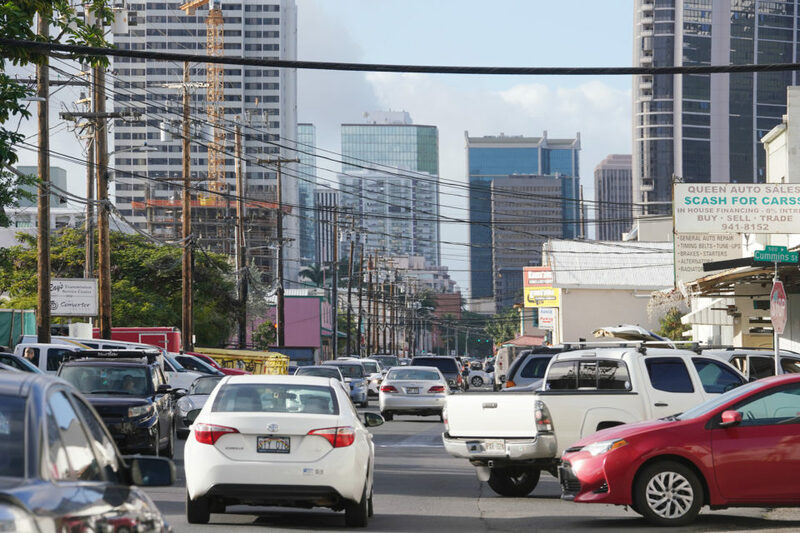 Our grid is about to enter the 21st century, with Hawaiian Electric’s plan to roll out smart electricity meters and other modernization strategies over the next few years. A smarter grid can take full advantage of resources like rooftop solar panels and electric vehicles. 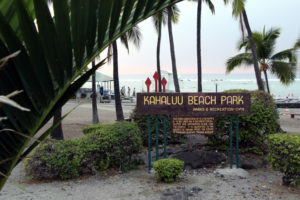 Kauai’s grid already has smart meters, so it should be rapidly expanding these types of distributed resources. 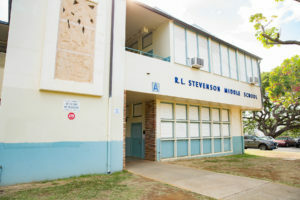 On Oahu, an innovative partnership between Hawaiian Electric and Bidgely (a tech startup from the local Energy Excelerator program) is taking an early look at how information provided by smart meters can help consumers manage their energy bills. And for times when renewable energy isn’t as steady as we’d like, the increasing diversity of energy storage options are changing the game. Kauai Island Utility Cooperative, the island’s electric cooperative, plans to build a solar farm backed by batteries, to provide low-cost clean energy day and night. 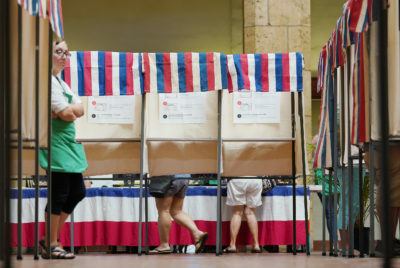 A mix of other energy storage options, like pumped hydro, home-based batteries, and large-scale hydrogen storage, will help us use Hawaii’s full spectrum of local, clean, renewable power. The bottom line? 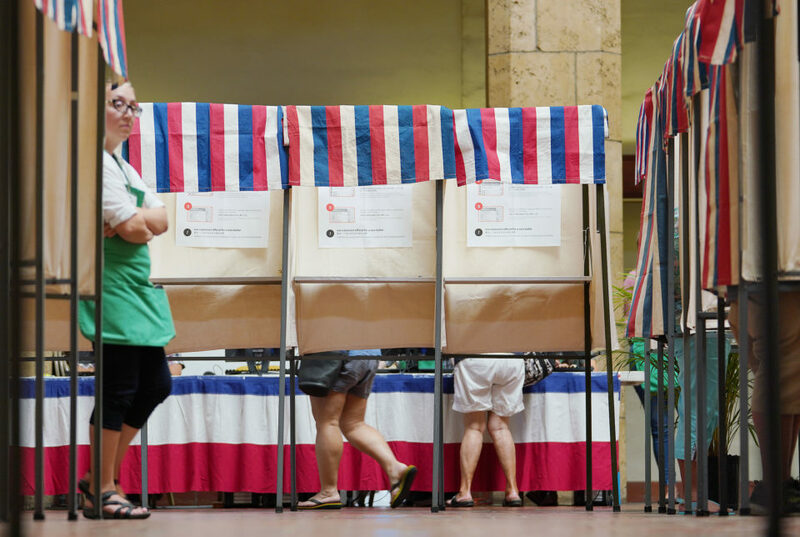 Hawaii’s progress on clean energy has been two steps forward — and two steps back. The stagnation from cancelled energy projects, strangled solar, and limited progress in transportation earned Hawaii the same grade as last year: B-. But bright spots on efficiency, renewables, and overall fossil fuel use reduction set us up to do better — if we make the right choices today for our 100 percent renewable future tomorrow. See the full 2016 Energy Report Card online at hawaiienergyreportcard.com. 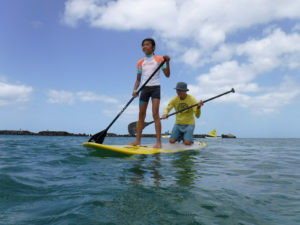 Melissa Miyashiro is Blue Planet’s Operations Director. 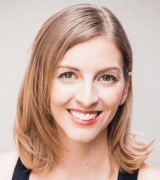 Prior to joining Blue Planet, Melissa worked as a legal fellow assisting various state agencies in Hawaii with administrative rulemaking, invasive species law and policy, and inter-agency coordination.